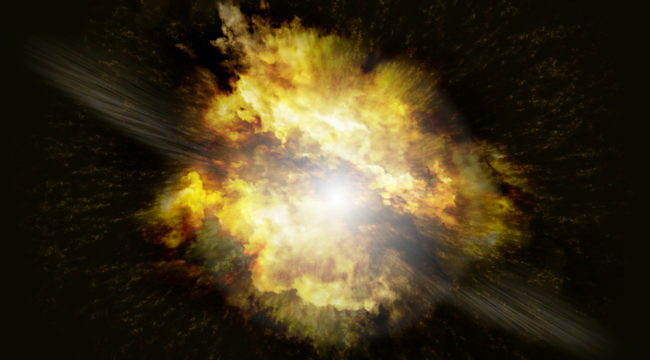 Is a $10 Trillion “Supernova” About to Explode? Is your portfolio prepared for the blowup? Gross gained the media reputation as the “Bond King” as the then manager of Pacific Investment Management’s $270 billion Total Return Fund. The flight to safety in global financial markets combined with negative interest rate policy (NIRP) by global central banks have helped create more than $10 trillion of government debt now trading below zero. And with financial uncertainty increasing, more people want to buy “safe” government bonds, pushing prices up. But since yields have an inverse relationship to price, increased demand pushes yields down. That leaves investors like Gross concerned that once rates finally go up, bondholders will incur massive losses. As yields go up, prices go down. In fact, a recent report by Goldman Sachs indicated that a 1% increase in yield on U.S. Treasuries could cost investors as much as $1 trillion in losses. A mere 1% increase in yield on U.S. sovereign debt could cause more losses than the entire sub-prime mortgage crisis of 2008? You bet. Seat belts on. So is Gross right about a coming explosion in sovereign debt? Look, the key part of his statement is “one day.” That day could come 10 days… or 10 months… or 10 years from now. And that’s why I am not in the prediction game. You can’t make consistent money using a crystal ball, even if said mythical ball is owned by one of the richest people in the world. Ruthless central bankers are creating these nonstop “boom, bubble and bust” cycles through carefully planned monetary experiments all designed to redistribute wealth from your account to the elites. For example, negative interest rates are their latest scam to steal. Shout out to Yellen for that one. You think you win there? Hell no. You are the target of their opportunity. The real question should be: Do you have an investment system in place to not only survive any implosion but also make money in the face of the next monetary Ponzi scheme? I’m talking about an investment approach that allows you to catch the trend going up with a bubble and to exit when it starts to burst. There is absolutely no reason you should be sitting at the bottom after the bubble has burst down over 50%… trusting that everything will come back. It might not come back. You need a plan for whatever happens next. Value investors were calling for it to pop in the mid-90s. But those investors ended up missing the most explosive gains as the Nasdaq went up 100% in 1999 alone. And when the bubble did pop in early 2000, “buy and holders” had no system to tell them that price trend had reversed and they were pulverized. Remember, the Nasdaq ended up dropping 77%. Only now, in 2016, is the Nasdaq back to those high levels in 2000. What would have been the best way to capture the fat part of the Nasdaq’s massive gains on the way up… while protecting you from its dramatic decline when the dotcom bubble burst? 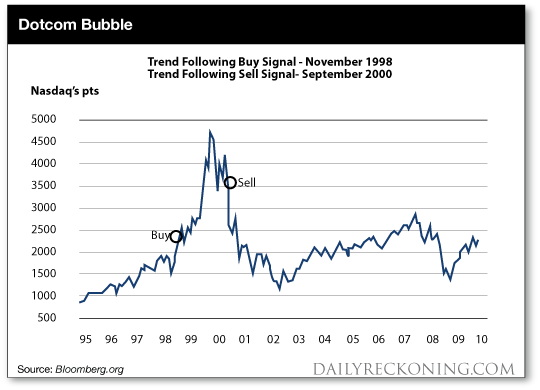 Trend following would have allowed you to profit from its gains in the sweet spot of the bubble. But it also would have signaled you when the price trend had reversed to prevent huge downside losses. Does your investment strategy allow you to do that? If not, you’re not prepared for what’s coming. And with more booms, bubbles and busts on deck, do you really want to face the possibility of losing more than 50% of your retirement account? How prepared are you for what’s next?